First question: what is gomtang (곰탕)? Gomtang is a soup that contains various parts of beef simmered under low heat. Some people use just one portion of beef, such as oxtail or ox's head, while others combine various parts. Gomtang tends to have a white, cloudy look to it. But not always. Next question: Where do you get the softest gomtang in Korea? Let's get real. No one ever ate at every existing gomtang restaurant. 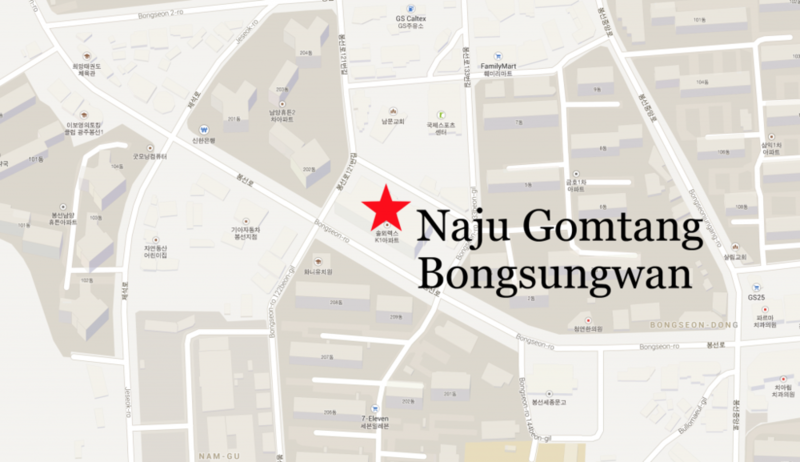 However Naju Gomtang Bongsungwan (나주곰탕 봉선관) in Gwangju serves the some of the most memorable beef soup your taste buds will encounter. We ordered three bowls of suyuk gomtang (수육곰탕) by the recommendation of our friend, who is a resident of the neighborhood. Word is: the regular gomtang is likeable, but the suyuk gomtang far tastier. The minute you have your first bite, you'll wish to rewind time and experience the moment all over again. The meat used in the suyuk gomtang is so soft that it melts in your mouth. The restaurant uses female cow head. They say it's softer than the male cow head. It may sound sexist, but biologically it works. Another element to love about Naju Gomtang Bongsungwan: self-service kimchi. Eat as much as you want or as little. Saves the server's time from refilling your dishes and limits waste. Or at least that's the goal. The napa cabbage kimchi was better than the average restaurant kimchi. The radish kimchi tasted sweet like candy. Suzy from Miss A eats here. After all she's a native of Gwangju, Korea. The owner gave me a copy of this photo after seeing me film in his restaurant. Smart choice. You scored yourself some brownie points, Monsieur. I shall go to your restaurant every time I visit Gwangju. Actually you don't have to be a YouTuber to receive a photo. Simply ask the front desk for a copy. The menu is simple. Soup and drinks. There's no need for anything else here. If you're known for one thing, why muddy it up with too many options? The storefront of Naju Gomtang Bongsungwan. There are many restaurants with a similar name. Make sure you go to the one at the address below.